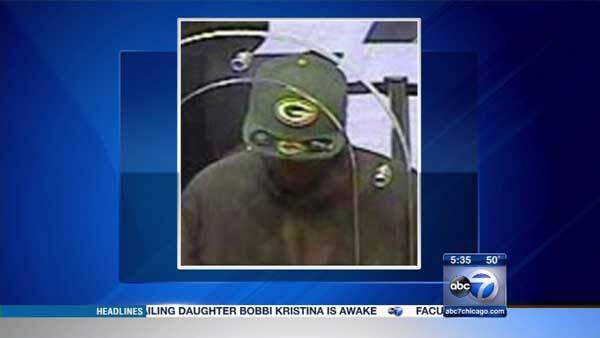 CHICAGO (WLS) -- The FBI is on the lookout for a man who tried to rob a South Side bank while wearing a Green Bay Packers hat. Agents said the suspect targeted the Chase bank branch in the 6600-block of South Stony Island Avenue in Chicago's Woodlawn neighborhood Saturday afternoon. The FBI said the robbery suspect is described as an African American man with a medium build, who is about 5 ft. 11 in. tall. Surveillance video shows he was wearing a cap with the Packers logo on the front. Anyone with information regarding the attempted bank robbery should contact the FBI at (312) 421-6700.